In this dryer, tubes are fixed to the outer shell housing & rotate along with the shell. Single / Multiple rows of tubes are circumferentially arranged on the internal periphery of the rotary shell. 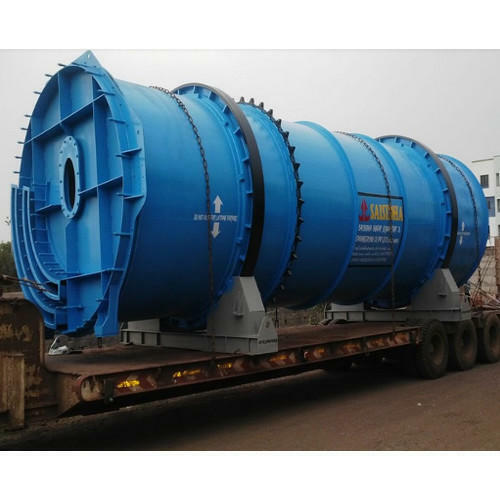 Rotary Steam Tube Dryer is supported on tyres / rollers & driven through suitable drive arrangement. Wet feed material is fed through center of one end of the Dryer by feed screw. Steam is admitted in the circumferential tubes from a rotating manifold installed towards material discharge end of the shell through Rotary Joint. Condensate is also collected through the same Rotary Joint. Material gets dried by conduction heat transfer & discharged from the openings provided on the shell at the other end. The openings also serve for fresh air intake. Vapors are removed from the feed end. Spiral flight lifters showered the feed material on tubes. AVM offers customized configurations of Rotary Steam Tube Dryers.